In preparation for a “very traditional English” Christmas, I have been known to coat the kitchen in a thick layer of butter, sugar, eggs and flour. “But how is that different from any other season?” you ask, and not without good reason. 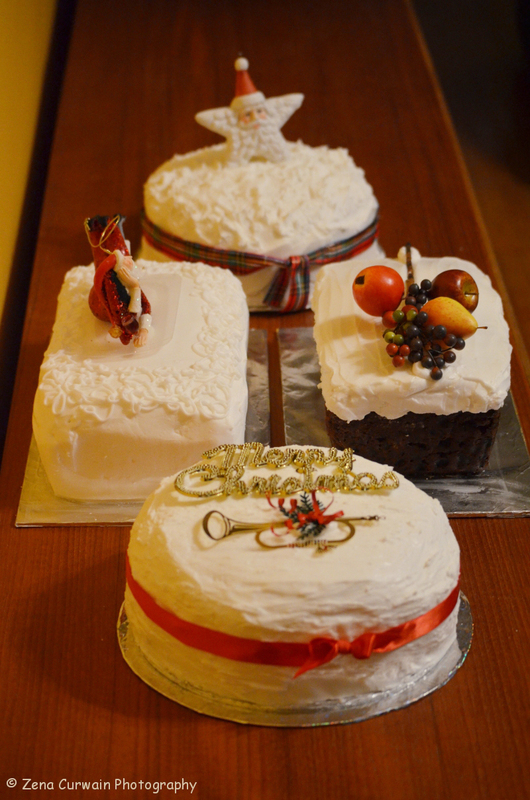 My Christmas includes a heavy fruitcake, decorated with almond paste and royal icing. Yes, the kind that nobody aside from my family seems to like. It’s a nostalgia thing. One of the by-products of royal icing (when you make four cakes like I do) is a large number of ‘spare’ egg yolks. What to do? Thankfully, Google can lead one to some answers, and I have discovered an excellent Tiramisu recipe on Epicurious that omits egg whites. There’s also advice to be found on how to freeze eggs. Who knew? Over the holidays, we hosted a friend who cannot tolerate gluten, so upping the ante a bit here, I decided that I needed to make gluten-free savoiardi (lady fingers) and serve her some tiramisu. A bit more research had me juggling between two recipes, and although I respected the method outlined in Paola’s Italian blog, I couldn’t bring myself to separate and weigh out 120 grams of egg yolks and 160 grams of egg whites. How many eggs is that, anyway? I reckoned it had to be ten, and I only wanted to experiment with a small batch. The Miss Munchalot blog recipe calls for three eggs, separated. Remembering that all of this is so that I can use up extra egg yolks that are now in the freezer, begin to think that it would be a better idea to make lemon curd instead. But I wanted to impress my friend who makes her own trifle from scratch, so was committed. Or should have been. Having settled on the ingredient list from one recipe and the method (nicely illustrated with photos) from another, I organised – mise en place. 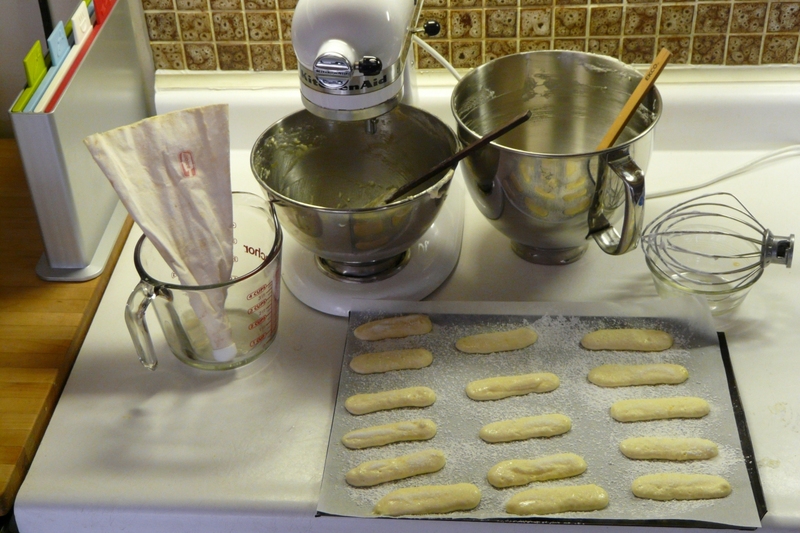 After whisking, beating and gently folding in, I piped out 34 misshapen fingers onto baking parchment, which had been dusted with icing sugar. A light coat of icing sugar was sieved over the top, followed with a sprinkle of super-fine granulated sugar (thank you Lantic). The icing sugar did melt away after a couple of minutes, so it was time to pop the trays into the oven. I’m still getting used to my “new-ish” oven, so the timer was set for 12 minutes – a minute less than the absolute minimum that either recipe called for. I’ve been producing well-done shortbread this year, and although the neighbours are very understanding, the message is coming through that I need to keep a closer eye on things. Reacting to the smell of burning is not an ideal situation to find oneself in! So, I had 34 gluten-free savoiardi sealed tightly in a tin, plus a package of Bonomi savoiardi purchased from Centro, our wonderful local store for all things authentically Italian. That’s where I go for fig syrup, Angela. Zabaglione is my next undertaking after this, and I’m really hoping that I don’t need to crack any more eggs. Here’s my amalgamation of the two recipes. Happy baking!